Mary Cannizzaro of South Salem, NY created this 22x22 gem for the Special Exhibits-Midsummer Madness. 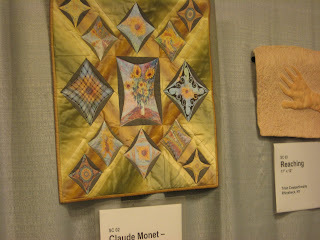 The quilts in the exhibit are based on an artist whose name begins with M. Claude Monet - Sunflowers, 1881 is the name of the quilt. I love its mellow tones. for a raffle quilt the Campfire Girls are making.